The elderberry is a fast-growing, nitrogen-loving shrub, indigenous to North America and Europe, that prefers forested areas, farms, or rural areas with lots of organic waste. They're often used as hedges in Europe because they are easily shaped and spread quickly. It's related to the honeysuckle and its creamy white and yellow flowers emit a sweet, heavy scent. Feathery, dark green, ovate leaves cover the stems, which branch off frequently and give the plant a rather sprawling appearance. Flowers emerge in late spring, and at summer's end, they will have developed into small, deep purple berries. Depending on the variety of elderberry, the berries can also be bluish black, red, or yellow. The elderberry easily adapts to poor soil conditions and spreads quickly as long as it receives ample sunlight. Left untrimmed, some elderberry bushes can reach a height of up to 30 feet. Pictures and a more detailed tutorial on their appearance can be found here. Variants of the ElderberryHistory of the ElderberryLocating and Identifying Elderberry TreesCleaning ElderberriesEating the ElderberryShould I Consume Elderberries? S. canadensis is commonly referred to as sweet elderberry. its deep purple berries are nearly black and the plant is indigenous all along the East Coast, from Florida to Nova Scotia and extending west from Manitoba, Canada to Texas. It grows well in both wet and dry soil conditions and has been used thoughout the ages for medicinal purposes because it has a high vitamin C content. S. ebulus is called dwarf elder and is the smallest of the species, attaining a maximum height of about 5 feet. White and purple flowers appear in late spring and the small, shiny black berries of S. ebulus are the least popular berries of the species. S. nigra is mostly native to Europe and has the darkest berries, which are the most popular for food and medicine. S.nigra attains a maximum height of about 20 feet so reaching the top berries might require climbing the tree. This variant has some close relatives, such as the Mexican elderberry and others that are indigenous to Asia. The S. nigra is also used as an ornamental plant in Europe and the U.K.
S. racemosa is indigenous to the Western U.S. and Canada and a subspecies of it comes from Northeast Asia. 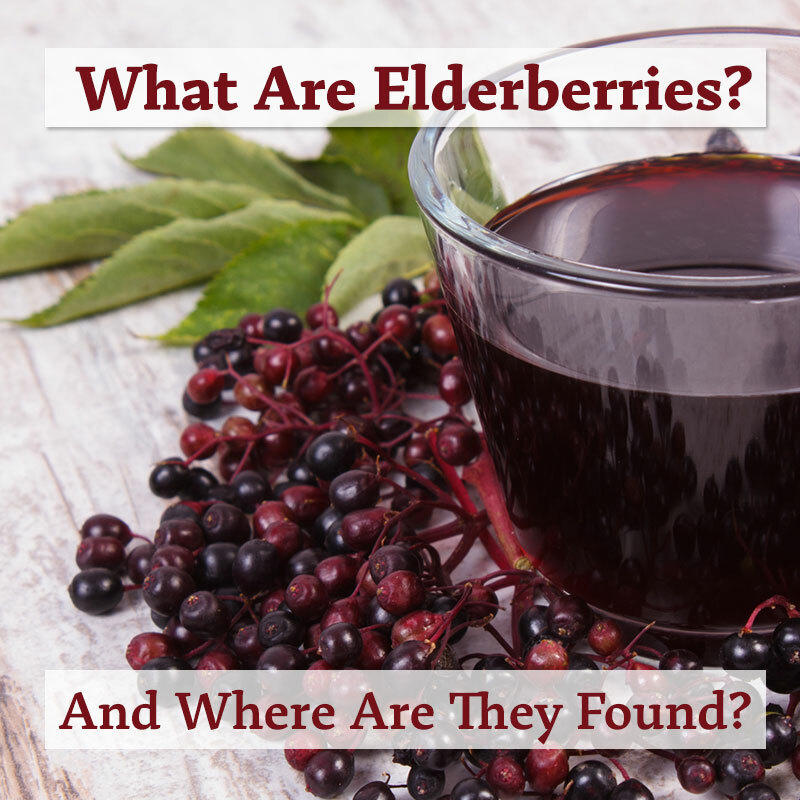 The name elderberry comes from the Anglo-Saxons and it was originally called the elder tree. Eldertrees were thought to be inhabited by a spirit who would protect those who cared for it, so it was planted profusely on the farm and around the home. Elderberry trees thrive in more rural areas and close to areas with a high nitrogen content in the soil. Since they are so prolific, if you find one elderberry, there's sure to be considerably more of them. Elderberries are often confused with water hemlock so it's essential to know which plant you have. Although elderberries can tolerate drought, water hemlock needs moisture, so if you're in a very dry area, the plant is most likely not water hemlock. However, The Definitive Guide to the Elderberry is a helpful resource to print and take with you when foraging for elderberries until you become very familiar with the appearance of each type. Since their appearance is quite similar to other highly toxic plants, it's best to have a picture handy for comparison. The link under "Eating Elderberries" also has a pictorial comparison of the elderberry and water hemlock. Elderberries don't have thorns. If yours does, it's probably a Hercules Club, commonly called a prickly elder, although it's not related to the elderberry. It's probably best to use shears to clip the bunch of berries from the branch and then remove the berries at home. Make sure to wash the berries thoroughly and to remove all traces of the leaves, stems, and bark, since they are poisonous and you don't want to ingest them. Elderberries can be stored in the freezer and don't have to be cooked first. The berries of the S. nigra are used for medicine, wine, jams, sauces, and pies, and are a favorite of the local birds. In northern Europe, the flowers are also made into a drink known as an elderflower cordial. Although the ripe berries are not toxic when cooked, eating too many of them raw may upset your stomach. The seeds of the ripe berries are poisonous so be sure not to eat any of them and all of the unripe berries are mildly toxic. Elderberry leaves, stems, and seeds contain glycoside, a toxin, which can build up in your system and make you very ill. The roots are poisonous and will kill you if you eat them. If you have any doubt about the species of the flowers you're going to eat, don't eat them! Elderberry trees resemble other plants that are toxic to humans so be sure you're eating elderberries! Although elderberry flowers are edible, they are often confused with the flowers of the water hemlock, so be sure which flower you're collecting if you plan to eat them; this may help in determining which plant you have. The flowers can be battered and fried for tasty elderflower fritters; Germans and Scandinavians make a very tasty soup from the ripe elderberries. Elderberries are full of antioxidants and vitamins, they've been used in a variety of applications throughout history. They've been comestibles, beverages, and medicine, as well as aesthetic ornamentation. Berry picking expeditions are great outings for the family and all will enjoy the fruits of their labor in one of its many tasty forms. Print out the guide above and take it with you, then go find some elderberries and enjoy them!